Good morrow lemmings – we’re currently taking all bets on how crap Melanie Phillips is in this edition. 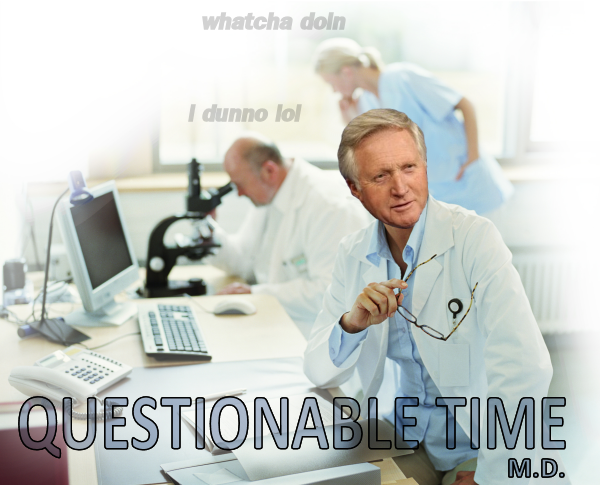 Let’s find out, as we dive right into…Questionable Time: in Scientifivision™! Let’s get ready to r…easonably debate! Our first question, and it’s a belter: is it right to blame the security services for not stopping them there three sisters and their families from travelling to Syria or ‘owt? At least some bright spark on the production team has decided to allocate the serious questions first this time, instead of leaving five minutes to spare at the end for such matters. Good! Well done, Question Time! You get a freshly-baked cookie. As a result of the trade-off for sensible debate (as opposed to the usual pointless squawking), things do get a lot more dour and less…well…squawky. David Davis, libertarian Tory extraordinaire and rival of Paddy Ashdown for the title of Squinty-Eyed Champion of the World (does he also have a hat to stuff in his gob?) says that it is right to ask how this tragedy happened but not to slap the blame on anyone willy-nilly. Meanwhile, Alex Salmond is equally sensible, his broad Scottish tones curiously hushed as he asks what the appeal is for vulnerable women to go abroad into a warzone with their children and fight for hatred. Melanie Phillips actually agrees, which is promising, urging the need for a better counter-radicalisation strategy and that the ‘danger’ is part of the appeal for impressionable youth. Caroline Flint, current Queen of Question Time (appeared the most during the 2010-2015 period – will she retain her crown until 2020?) and Labour deputy leadership contender, says that we don’t hear enough about accounts of the atrocities coming from people who want to get back, and how the situations of adults and children going is markedly different. Other Guy AKA Lionel Barber, editor of the Financial Times, pleads that people in MI5 are not appreciated enough! Stop being mean to them! 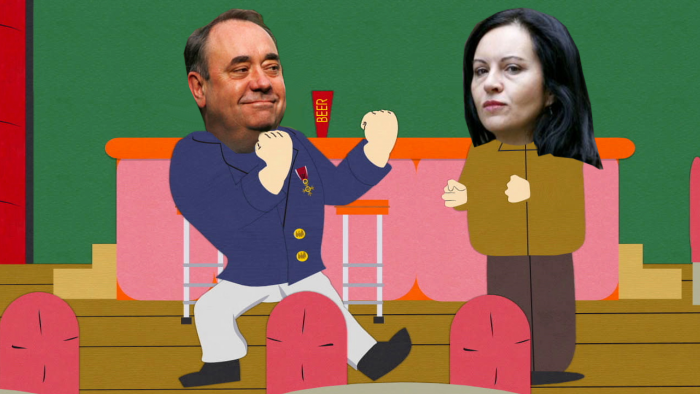 Melanie goes full student politics by declaring that we purely see the world through a Western, colonialist lens, and Salmond says the Western world is not immune from religious fanaticism – such as that for the SNP! Ayy! …Ah, just kiddin’ youse guys. Overall, very mature, very sensibly-debated, and even the applause was sombre. Good job everyone. Next up: bloodsports time! Would it really be so bad to find ourselves out of Europe, the next question-askerer says…as we are “Great Britain”, after all! Woah, never thought of that one before. Lionel launches a sick burn in his whispery monotone – we may be Great Britain, but we’re not “Little England”. Then he goes on and on about m-muh roaming charges. M-muh sovreignty, says Melanie in response. Apparently, we put more in than we take out, and shake it all about. Alex Salmond is then pressed on his solidarity with the people of Norway. This show gets weirder by the minute. No, says Big Al, any relation between this oil-rich solitary nation and a certain other landmass is purely coincidental. Anyway, he goes on, both England and Scotland are members of Europe, and he hopes that he can join forces with other sympathetic parties in Europe to rid his country of the Labour scourge once and for all. Well, that was the gist of what he was saying, at least. Caroline Flint tuts and shakes her head. Oh Alex, you card! David Davis declares that the nasty bullying of Greece due to its falling on its face and getting poked by long pointy German sticks represents a “failure of democracy”…sounding pretty Bennite there, double D! Caroline, on the other hand, goes all-in for a Yes vote (while encouraging m-muh reform) and states that the EU is a great trading partner. Melanie brushes this off and pretty much gives the entire country of America the middle finger while doing so. Oh Melanie, you card! “Let’s leave the EU for the moment”, says Dimbleby, and everyone laughs. Indeed, why not put a ‘lol’ option on the ballot paper? I’m sure it’d attract a surprising amount of support. Nexty-wexty: should Tim ‘women are crybabies’ Hunt have fricked off? Melanie, while acknowledging Hunt as “bonkers”, claims that he is a great eccentric and that his magisterial free thinking on the role of women in STEM fields should be encouraged! He’s a trailblazer! Free expression! Love and peace, man! Caroline pointedly points out that some women might be a little miffed that this behaviour from an already highly regarded and wealthy man should be protected, but then the women in the audience have their say. Their opinions vary due to BBC guidelines but seem reasonable enough either way. Most people seem to agree that while what Hunt said was terrible and should be widely mocked, sacking him was more iffy territory. Then again, apparently he didn’t mean it as a joke and didn’t apologise, so…shruggie. Thank goodness we have Alex Salmond to steer us on the right course, by means of…wibbly-wobblying somewhere in the middle of the argument, something he does very rarely. Also, David Davis misquotes Voltaire, and damns the ‘Twitter mob’ that has struck terror into his heart. Even though he doesn’t have a Twitter. Okay, D-Dubs. We wrap up with another well-answered question (damnit, Question Time, you need to be viler! ): do we have a responsibility to help immigrants fleeing from Africa? Salmond says 65% are refugees and we have to help them as the government in the 1970s helped refugees fleeing Idi Amin. Also we screwed up most of their countries so, y’know…what goes around comes around! Lionel and Caroline argue the need for a “moral obligation” to help those in danger of drowning – Melanie argues that while economic migrants should be scrutinised, what we really need to do is hit the PANIC BUTTON on the whole Middle East in general. David Davis shrugs his shoulders and wonders how life would be different if he was Tory Prime Minister right now. Final, rhetorical question: what are the chances of some chubby guy living to see the conclusion of the Chilcot Inquiry? Next time: the return of Mangaman. I was a bit nonplussed when I heard that Francis Maude was going to be on as he’s one of those figures who, despite being around forever, just seems to flit in and out of the picture, never staying still long enough for me to really pin him down. Similarly, Burnham drew a vague ‘meh’ from me as while he’s a very proficient QT-er who does a good line in the whole ‘local lad come good’ trade, he’s so constantly on-message that I can never really see past the bluster (or – for that matter – those shimmering, dazzling eyelashes of his). ‘Fair to middling’ was the best I hoped for. As it happens, these two turned out to be an inspired choice and what we got was a battle of wits that to’d and fro’d satisfyingly throughout the evening. The key to it is that both protagonists are very ambitious but in different ways. Maude, with his hawk-like features and buzzard-esque stoop has the look of a man who Knows Too Much (although not, it should be remembered, about the safe storage of fuel) while Burnham is a classic Set Piecer, the sort who really hammers rhetorical points mercilessly whilst always making sure he ends with a crescendo. Both men can smell the other’s ambition and both men can’t help but be vexed by it. To start with, the Set Piecer strategy seemed to be a nose ahead and despite putting up a pretty decent fight, Maude spent both the health and economy questions fighting a rearguard action with only limited success. However, he regained his balance in the Leveson question and did so just at the point that Burnham began to falter. It went like this: Maude got the first shot and did a pretty reasonable Next Stop Zimbabwe take on press freedom that garnered a fair few claps. Burnham though, well he fluffed his opening and had to resort to stealing Tim Farron’s answer almost word-for-word. As it turns out, the Set Piecer in him managed to blag it and parity was restored although not for very long. What happened next though was genius. Out of nowhere, Maude suddenly turned to Burnham and sincerely thanked him for his part in uncovering the truth about the Hillsborough tragedy. Well, that move was nothing short of inspired and not only did it earn him a metric tonne of applause, it also left Burnham with nowhere to go. The Well Timed Compliment: It’s the napalm of QT. Following some extensive skullduggery, I was lucky enough to find myself in the crowd for the Leeds edition of Question Time that ran earlier this year. It was a pretty good show – one in which I thought that George Galloway was actually going to lamp David Aaronovitch – but the real revelation was Tim Farron. It boiled down to this: I automatically assume that politicians are up to something sketchy until they can prove otherwise yet the moment that Farron caught my eye, I remember thinking ‘Oh my god, I implicitly trust this guy’. True, I was high as a kite on adrenaline after asking a question and the self-inflicted dehydration didn’t help (I was terrified of needing a wee) but there was just something about Farron that overruled my default cynicism. I rapidly developed an alarming political crush, a crush that’s now so out of control that I find myself making gifs of an idealised chance encounter between myself and Mr. Farron (see. Fig. 1). It is also a crush that remains undimmed by last night’s episode. Alright, I’m a little confused here. Why exactly was Leanne Wood on last night? Don’t get me wrong, this isn’t a dig at Wood herself as I happen to rate her quite highly, partly because I like her viewpoint but mainly on account of her delivery: It’s just so nonchalant. Honestly, there could be someone running at her full-tilt, whilst brandishing an axe and she’d just quietly reel off a list of reasons why they shouldn’t until they eventually stopped dead in their tracks, perplexed by this barrage of dry reason. No, the reason I ask is that we were in Swansea last week and if you ask me, that sounds like a pretty appropriate venue for the leader of the Welsh nationalists. Liverpool though? Not so much… Unless of course we’ve somehow hoodwinked the Welsh into taking Maloney off our hands in which case I whole heartedly endorse this impromptu rearranging of borders. Hmm… Don’t know what to make of this one. On the one hand, he didn’t say anything massively stupid but the way his speech halts in the middle of every sentence is a little disconcerting as was his bungled joke at the start of the Leveson question (it was memorable only for the uncomfortable parade of tumbleweed that followed). No, there’s something about this guy that doesn’t add up and I found watching him to be like using an elderly relative’s computer: On paper, it should be a great machine but a combination of rashly installed toolbars, screaming demands from paid-for anti-virus software and the fact that the toolbar is now inexplicably at the top of the desktop just make it all a little fraught. I reckon we start with defragging but progress to a full format if that doesn’t get us anywhere.